Genesys APIs provide enterprise developers and partners with the ability to extend and integrate custom applications and third-party software with the Genesys Customer Experience Platform. Subject to the terms and conditions of the Developer License Agreement (for Partners) or the Customer Developer License Addendum, Customers or Partners are authorized to undertake specific integration development activities listed in the table below. Any integrations not listed below should not be undertaken without the express written consent of the Genesys Senior Vice President of Product Management, Steve Rutledge, prior to commencing any development activities. The prerequisite Genesys Products that the end user or Customer shall have previously licensed from Genesys. B A voice-only agent or supervisor Desktop Application that provides the ability to handle voice interactions and has been developed using the Interaction SDK or .NET Toolkit. Either Framework or CIM platform (or any bundle inclusive of these). One Agent Connector per seat. B An agent or supervisor Desktop Application that provides the ability to handle any interaction type. Either Framework or CIM platform (or any bundle inclusive of these). Some functionality requires other products (e.g. email would require the Email interaction) One Agent Connector per seat. C Any non-Genesys Media integration, such as Email, Chat, SMS or Video interactions managed by a non-Genesys system.Example: a media server that handles SMS messages within Genesys. CIM platform (or any bundle inclusive of these) Some functionality requires other products (e.g. email would require the Email interaction server) One 3rd Party Media (including Lab versions, and upgrade versions) license per seat/per media. Previously known as Open Media Interface. There are no restrictions on the statistics and configuration data that these applications can access. Either Framework or CIM platform (or any bundle inclusive of these) Some functionality requires other products (e.g. email would require the Email interaction) One Advanced Integration Connector per seat. There are no restrictions on the configuration data that these applications can access. F Any non-Genesys WFM integration developed using Universal SDK.Example: a 3rd party WFM product that requires Genesys statisics or configuration synchronization. Either Framework or CIM platform (or any bundle inclusive of these) Some functionality requires other products (e.g. email would require the Email interaction) Not authorized for resell in most cases. Contact Genesys to obtain approval for redistribution.T-Lib SDK is not allowed/supported for WFM integrations. One WFM Connector per seat. G Any Wallboard integration. Either Framework or CIM platform (or any bundle inclusive of these) Not to be used for desktop integrations. Can be used for any application that displays statistical information to contact center staff, when the number of seats cannot feasibly be estimated. One Wallboard Connector (including Lab) per site. 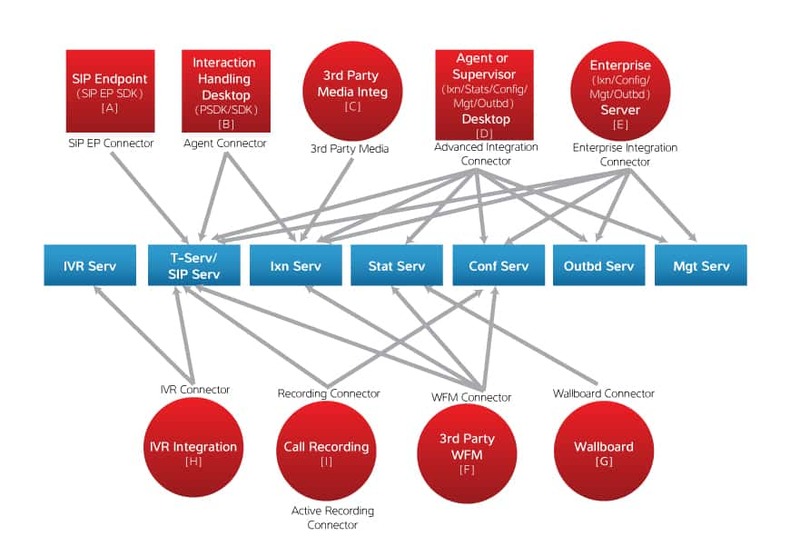 H Any non-Genesys IVR integration. Either Framework or CIM platform (or any bundle inclusive of these) Not authorized for resell in most cases. Contact Genesys to obtain approval for redistribution. One IVR Connector per port. I Any Recording integration. Please note: currently Active Recording Connector is only available for integration with Genesys SIP Server. Either Framework or CIM platform (or any bundle inclusive of these) One Recording Connector (including Lab) per seat. “Agent Workstation” or “Seat” means any device that is enabled to carry out the instructions of a software program directly or virtually to allow use of the licensed Genesys Products by a maximum of one (1) agent at any given time. An Agent Workstation may be configured to allow multiple agents working in shifts to use the licensed Genesys Products; provided that it is not enabled for concurrent use. Once enabled, a workstation is defined as an Agent Workstation until disabled, whether or not it is in active use by any Customer agent. “Supervisor Seat” means any device that is enabled to carry out the instructions of a software program directly or virtually to allow use of the licensed Genesys Products by a maximum of one (1) supervisor at any given time. A Supervisor Seat may be configured to allow multiple supervisors working in shifts to use the licensed Genesys Products; provided that it is not enabled for concurrent use. Once enabled, a workstation is defined as a Supervisor Seat until disabled, whether or not it is in active use by any Customer supervisor. A “Site” is a contact center with a single physical location where a group or groups of agents process interactions and these interactions do not need to be routed to another physical location. “Port” means a communication path enabled to support a single user session specific to one (1) application.